Boston Properties may add retail at 100 Federal St. The company that owns 100 Federal St. in Boston is reportedly looking at ways to attract more activity to the plaza around it. The owner of one of the biggest buildings in Boston’s Financial ­District is exploring plans to open multiple restaurants and shops on its heavily traveled plaza. The project at 100 Federal St. is still in its preliminary stages. But owner Boston Properties Inc. is seeking to create a more vibrant gathering space by adding new retail offerings at the base of the tower, which stands across from Post Office Square Park. The company is weighing several different options, including enclosing a portion of the plaza in a glass structure for restaurants and food-oriented retail businesses, said a person with knowledge of the company’s plans who was not authorized to speak publicly. A Boston Properties spokeswoman did not respond to requests for comment Thursday. The company purchased the 37-story building for about $610 million last year from Bank of America, which still occupies about 60 percent of its office space. The reddish-brown tower, known for a distinctive bulge above its base, has been a symbol of Boston banking since it was built in 1971. The plaza project comes as the city’s downtown is getting an influx of new residences and retail stores that promise to revitalize much of the area. The Financial District’s office market is also quickly recovering from the economic downturn, with several new technology companies joining its traditional mix of investment companies and law firms. “The pace of leasing activity picked up considerably in the second half of [last] year,” said Bill Anderson, an executive with the real estate services firm Cushman & Wakefield. The firm reported Thursday that Boston led all major US real estate markets with 1.8 million square feet of positive leasing activity in 2012. Nearly two-thirds of that space was in the Financial District. Anderson said the district could further capitalize on the trend by adding new restaurants and shops to keep street life active throughout the day and evening. “People really want to have these kinds of public spaces where they can connect and trade ideas,” he said. 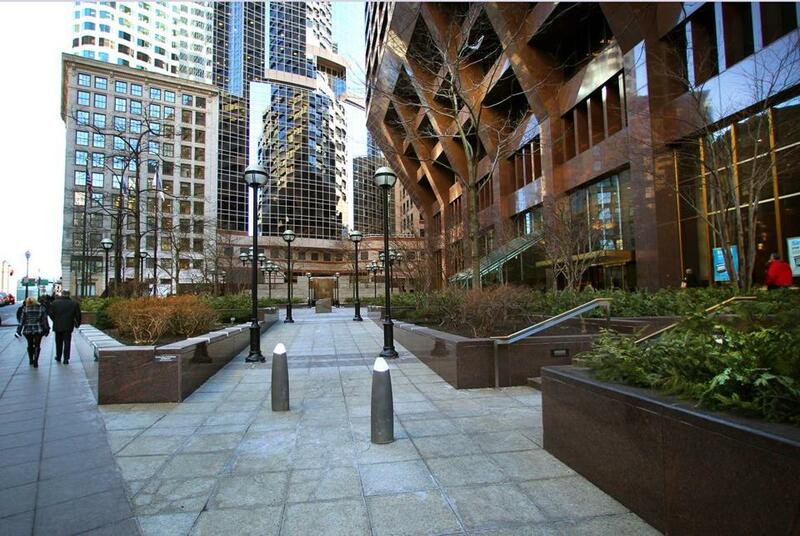 The triangular plaza outside 100 Federal St. offers ample room for new retail options. The space currently has several planters and benches, but offers few reasons for people to stop and linger, especially in cold weather. Most of the new retail would be focused on restaurants or food, said the person with knowledge of the plaza project, but no tenants have been signed. Boston Properties has hired architecture firm Prellwitz Chilinski Associates Inc. to plan and design upgrades to the tower’s plaza and basement. The plan to add retail to 100 Federal is reminiscent of other Boston Properties projects around the city. The company recently developed the nearby Atlantic Wharf tower that features the burrito shop Boloco and a Smith & Wollensky steakhouse the overlooks Fort Point Channel. Boston Properties also added new restaurants and stores to the base of the Prudential Center complex in the Back Bay. The company owns dozens of office buildings across the region. Correction: Tenants Iron Mountain and Homesite Insurance Group are moving into an office building at One Federal Street. The address of their relocation was misidentified in a prior version of the story.